For those with hungry bellies and an ear for cowboy music, you won't want to miss the Horn Family's Circle B Chuck Wagon and Cowboy Music Show. A visit here is like stepping back in time where one is instantly transported to the square of an old western town. Guests are provided with pre-show entertainment including old-time western movies and free popcorn. The clanging of the dinner bell signals the start of the Chuck Wagon feast. Homestyle cooking is brought directly to your table for you to eat up. Supper is followed by a rousing hour of authentic country music and comedy. 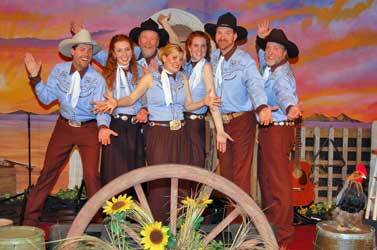 The Riders of the Circle B, consisting of Horn family members, entertain guests with family-friendly humor and with the songs that cowboys made famous. The show will feature a special tribute to Ireland, where performers will be adorned in kilts and hats and sing music from Ireland. 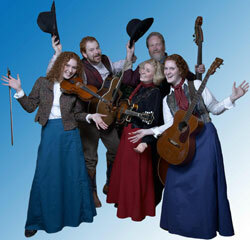 The family's tight harmonies and hilarious antics are quickly becoming the talk of Branson. 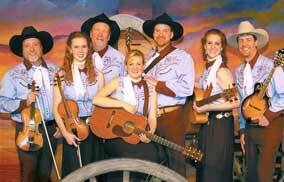 Add an extra entertainment experience to your show with the Diamond Wranglers, who come from Wichita, Kansas, and will provide plenty of their own country and guitar music. Sing and dance along to this notable band. The Circle B will provide you with the same great songs from their original show, but they'll be substituting in a few Christmas favorites. You might even find yourself singing the yuletide carols along with them! Was right up front, and a nice family show. I enjoyed the ore show black and white shows. The horn family did a good job entertaining us. We loved this show! So much fun!! Great food, wonderful old movies/tv shows, and fantastic entertainment! Thank you!